First aid medical button. First aid medical button sign with reflection isolated on white. First aid medical button sign with reflection isolated on white. First aid medical button symbol on a white icon on a white background. Vector illustration, EPS10. Illustration of a caduceus medical symbol on a red and white first aid button. Illustration of a first aid medical red cross symbol on a white button. 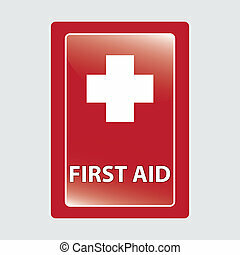 First aid button on white background. Vector illustration.